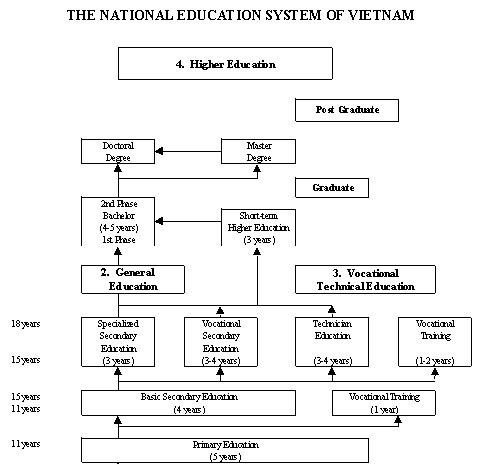 The new national educational system, according to the government decision No.90/CP, made on 24 November 1993, consists of five sub-systems: Pre-school education, General Education (with the structure 5-4-3-4), Vocational-Technical education, Higher education, and Continuing education. Pre-school education is composed of create of 3 years and Kindergarten for 3 years. From 6 years old children are admitted to primary education (5 years) leading to the certificate of primary education. After that most of them continue to the basic secondary education (4 years) and some of them may be admitted to vocational training for 1 year. Finishing basic secondary education with the certificate some of those children can continue specialized secondary education or upper secondary school general for 3 years or technical 3-4 years or vocational for 3-4 year. In addition some of them may be admitted to vocational training for 1-2 years. Finishing upper secondary education usually at the age of 18 or after 12 years of schooling pupils have to take the national school leaving examination. With a diploma from upper secondary school or diploma of general education (Tu Tai) a student can take part in the entrance exams of H E institutions. For under-graduate level there is either short-term higher education (3 year) or long-term H E (4-6 years) of regular full-time education or part-time education (and in-service education of continuing education). For post-graduate level there are Master's programmes (2 years) and doctoral programmes (2-4 years).